AA6E Station Log: Data Footprint Control -- Your own email server! Lately I've been talking up the idea of "data footprint". It's a fact that we're spreading all kinds of personal data around the Internet in the course of our modern electronic and financial lives. Our bank, Facebook, Google, Yahoo, Comcast and essentially everyone we do business with is collecting data about us. The data get bought and sold and snooped no matter what our wishes may be. One concrete thing I could do, while having a bit of fun, was to move my Google email back to a server computer under my own control. That's (a) a rather old-fashioned thing to do, (b) rather complicated to set up correctly, and (c) a losing game in terms of functionality. No doubt Google Mail sets the standard for usability, especially for power users. It also has the best anti-spam technology I've come across. So if we step back to a local server, we will be losing some useful features. It happens I have an older Raspberry Pi (256 MB Model B) which hasn't had a particular mission. So now it is the household IMAP server, with my 1.6 GB email stash on a 16 GB SD card. It would have been easier to use a big PC for this function, but I wanted a platform that I could leave on 24/7 without eco-guilt. It uses just a couple of watts of power. It's a just a symbolic step. We have a long way to go before we get control of all our data. UPDATE 1: The dirty little secret they don't tell you at e-mail school is that most e-mail is spam, and an e-mail server without spam filtering is ... not worth a lot. On the client side, Thunderbird and some others make a valiant attempt, but it wasn't going to work for me. Especially since I want to use an Android client like Kaitin (no spam filtering) for mobile e-mailing. So I consulted https://help.ubuntu.com/community/PostfixAmavisNew. (Ubuntu is close enough to Raspian.) Everything installed OK until it became clear that my 256 MB Pi might not support a big freshclam update. OK, we don't need antivirus for Linux/Android, do we? Anyway, the server has started bouncing spam pretty well now. 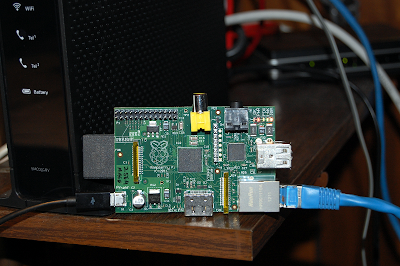 And the Pi can feel virtuous as it crunches on each message for a second or two. UPDATE 2: ClamAV is hopeless, taking way too much RAM and CPU. Fortunately Amavis doesn't need antivirus, so it's OK just to remove it from the system. Even so, Amavis & co. take a lot of RAM and just fit in the 256 MB machine along with Linux. If I start doing package updates, for example, there is a lot of "disk" thrashing -- swap utilization climbs, and things go very slow for a while. (But no crashes!) A 512 MB machine would be much better. Spam scanning and message handling seem to take 5 to 15 seconds per message. This is not a high volume solution, but it handles my load OK.
UPDATE 3: This project was a success technically, but Comcast woke up to it (maybe they read my blog?) and they blocked port 25 on my service. Maybe I could have argued my case, but I didn't pursue it. Instead, I moved my email action to Pobox.com, a commercial outfit that specializes in email - and doesn't sell my info to the highest bidder, hopefully.